Click here to download (pdf) the Trash Collection Zones. 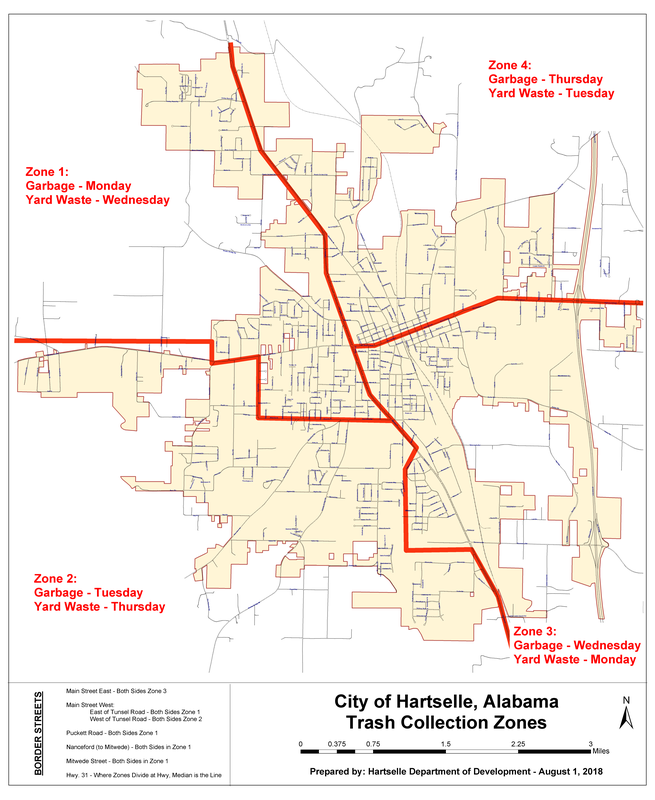 The City of Hartselle Uses automated garbage collection. Residents are provided with a special 96-gallon roll-out cart. Collection trucks are equipped with a lifting mechanism on the side that will lift and empty the cart and will return the cart to the ground. The process takes about ten seconds and can be performed without the driver leaving the truck. For a successful pickup to occur, the cart must be placed curbside according to directions. 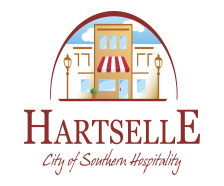 If you are new to the City of Hartselle, please call Public Works to set up an account at 256-773-2643. No more lifting or dragging your cart to the curb. Garbage is collected more efficiently, which results in a cost saving for residents. The system is more uniform, cleaner, and more attractive. The cart is animal proof and cannot be toppled by small critters. The lid is attached, which helps to control windblown litter and odor. The cart is always returned in an upright position with the lid securely attached. What size cart do I use? Everyone is issued one 96-gallon cart. One cart holds in excess of three average 30-gallon bags and will be sufficient for most household garbage. You can request up to 2 additional carts at a cost of $3.00 per month for each additional cart. You are encouraged to bag and tie garbage before placing it in the cart. Do not pack your cart so tightly that it will not empty. Trash placed alongside the carts or in other containers will not be collected. The arrows located on the lid and metal bar on the front of the cart should face the street, and handles should face away from the street. The lid must be closed so that nothing can spill out during the emptying process. Do not place anything on top of the lid, as the driver will not empty the cart. Place the cart within two feet of the street and at least five feet from trees, cars, mailboxes, poles, other city containers, etc… or the driver will not be able to empty it. All carts must be accessible and placed for collection by 6 a.m. on the day of collection. Inaccessible carts will not be emptied. You may also carry excess garbage to the landfill dumpsters. What days will my garbage be picked up? Please call Public Works at 256-773-2643. Carts belong to the City of Hartselle Public Works Department and are under the care of each customer. If you the customer damages the cart then you will be responsible to replace it. However, should Public Works damage a cart, it will replace the cart at no charge to the customer.